The intent of these Sessions is to help you become a better, more confident shooter. 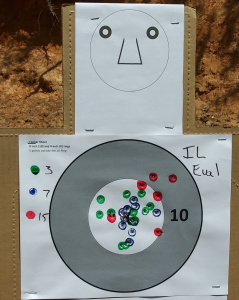 Most people have very little idea of what to do when they go to the range. As a result, they waste their time, money, and ammunition without accomplishing anything. The idea of the Sessions is to provide a progressive structure for a shooter’s practice over an extended period. This is how humans increase their skill level, incremental increases in difficulty and accomplishment over time. 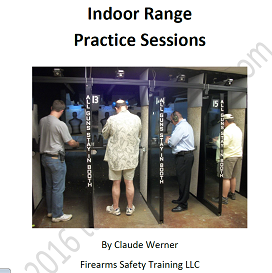 Most gunowners only have access to an indoor range. There are considerably more restrictions placed on shooters at indoor ranges than at outdoor ranges. These Sessions were designed with those restrictions in mind. For example, most indoor ranges do not allow drawing from the holster, so the Sessions work on the general idea that no drawing is possible. Similarly, multiple target arrangements are not possible when shooting in a booth at an indoor range, so the Sessions do not include multiple targets. These Sessions are intended for people who have purchased a firearm for personal protection. They are directed toward newer gunowners; however, ‘newer’ is a relative term. Many people who have owned, and perhaps shot, firearms for years aren’t as proficient as they think they are. Being a hunter, military veteran, security guard, or even police officer is no guarantee of being competent with a pistol. The difference in contexts is huge and often misunderstood. There’s a big difference between reading about skill development and practicing it. If you didn’t know how to swim, you certainly wouldn’t expect to read a book about swimming and then assume you knew how to swim. Pistol shooting is no different; you have to get out of your chair and actually do some work to develop a degree of proficiency. You have to do work if you want to learn to actually DO something. Just reading about a skill doesn’t accomplish much, other than entertainment. Learning to shoot is an ongoing process. A misunderstanding that people have is thinking they can take a short training course, attend a seminar, or read a book and then feel they are ‘trained’ or ‘knowledgeable.’ Nothing could be further from the truth. We can only absorb so much information at one time. If we don’t practice what we’ve learned, that skill or knowledge slips away quickly. Repetitive reinforcement of our learning is key to developing and maintaining skill.